My standard range consists of the 7 Tray Pheon and the 14 Tray Crozier. The cases of the cabinets are similar in all respects to the coin cabinets. Medal trays however, are twice the thickness of coin trays, so the number of trays in each is halved. Medal trays are made up from sold mahogany mouldings with a flat mahogany base. The tray is lined with a felt pad, the polished front edge is fitted with two turned brass knobs. Internal dimensions of the trays are 245 x 230 x 12mm (9 1/2 x 9 x 1/2 ins). I can also supply Medal Cabinets in Pheon Classic, Crozier Classic and Coronet formats. Fitted with 7, 14 and 15 trays respectively, the front edge of each tray is moulded and polished to match the classic tops and plinths. 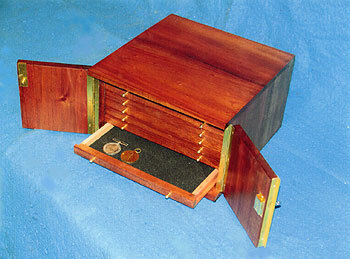 As with the coin cabinets, I can offer a full custom made service.